Nutritional Value : 34 kcal, 4.2 g protein, 110 mg calcium, 4.7 mg iron, 2.4 mg vitamin A, 35 mg vitamin C per 100 g serving. Native to Southeast Asia, this climbing plant is a close relative of the cowpea or black-eye pea. It comes in different varieties from the more common pale green pod variety, to the more slender darker green one, to a deep brownish red variety. 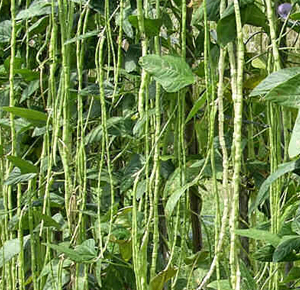 These beans are rich in vitamin A and contain a fair amount of vitamin C.
It is an annual long trailing vine usually grown on poles for support and often reach heights of 9-12 feet. The plant has large pale pink to violet-blue flowers. The pods will grow up to 12 to 30 inches long, depending on the variety, with each pod containing several edible seeds. This plant continues to grow after flowering and fruiting. Long Beans are mainly a warm-season crop and will survive extreme humidity and heat. It can be planted in a wide range of climatic conditions but is very sensitive to cold temperatures. Propagation is through direct seeding or transplanting. They prefer a light, well-drained soil with a pH of 5.5 to 6.8, enriched with organic matter, such as compost or dried manure. Plant the seeds 1-2 inches deep in warm soil. Germination will take place within 6 to 10 days. Soak the seeds in water before sowing, for better germination. Transplants should be done in such a way as to avoid disturbance to the root system. The plants should be placed 2 to 3 feet in rows and the distance between rows should be 4 to 6 feet apart on raised beds or ridges. Dwarf growing forms can be planted much more densely. Place poles and give wire or twine supports in rows. Extra fertilization is not essential as long as you have enriched the soil before planting. But the plant needs heavy watering at regular intervals. Flowering will occur 5 weeks after sowing. Fruits will grow from open flower to suitable length in about 10-12 days. Pick the pods at the tender stage at maximum length, before the seeds mature or swell. Yard long beans may grow up to 24inch long, but it is better to pick them at 12 to 18 inches. While picking, cut the pods with a sharp knife to minimize plant damage, thus maximizing harvest. Leave the pods to reach full maturity, allowing them to dry on plant, if the pods have to be reserved for seeds. The pods will break open and the seeds can be collected. The plants are susceptible to black bean aphids, spider mites, nematodes, and mosaic viruses. Aphids, particularly the black bean aphid are drawn to the pods of this plant. Bean fly is the main pest causing small yellow spots on the leaves. They can be treated by spraying dimethoate. Red spider mite produce a speckled silvery appearance on leaves and can be treated by spraying dicofol. WHAT TYPE OF CLIMATE IS SUITABLE FOR CLOVES TO GROW? Ever time i grow ladies finger plants, they are stunted, they dont grow more than 1 feet height, they just flower poorly and dry. Does it specifgy any nutrional deficiency?? Use indian cow dung and urine as fertilizer. You should get good result. Also use non-hybrid seeds. Request you to kindly purchase good quality of seeds, pls verify your soil is ok or not, if not pls mix soil & compose approx 70/30 share and put ur seeds 3days in sunlight before panting. Am planning to cultivate pumpkin and thinking to sow seeds in january month end is there any risk and what will be the average yeild per acre at maturity.